You will find the downloadable pdf version below. Our gift is the effort to get a copy into your possession in the hopes that you will read it. We also encourage you to forward copies to everyone that you know, including family, friends, business associates, and in particular give copies to every young person that you can. The book is an easy read, but contains wisdom that is often hard to come by these days. Most of the critical problems that we are facing in this country today stem from a rampant ignorance of basic economics. A Congress and an electorate that understood simple economics would never have allowed us to get into the budgetary wastefulness and debt crisis that the country now faces. Many people fail to understand that the laws of economics are like the laws of gravity–you ignore them at your peril. Unfortunately most of our schools don’t teach this, and our children graduate without the necessary knowledge needed to make sound financial and life altering decisions in later life. This book is only a start, but it can be the seed that germinates into the fruit that drives the quest for knowledge and truth. This is true regardless of your political leanings or religious beliefs, and we truly hope that you will benefit from it. 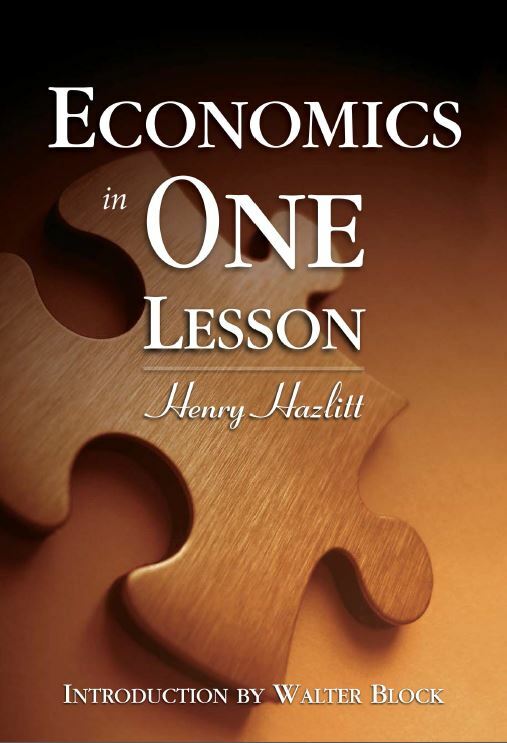 “Henry Hazlitt wrote this book following his stint at the New York Times as an editorialist. His hope was to reduce the whole teaching of economics to a few principles and explain them in ways that people would never forget. It worked. He relied on some stories by Bastiat and his own impeccable capacity for logical thinking and crystal-clear prose. He was writing under the influence of Mises himself, of course, but he brought his own special gifts to the project. As just one example, this is the book that made the idea of the “broken window fallacy” so famous. Concise and instructive, it is also deceptively prescient and far-reaching in its efforts to dissemble economic fallacies that are so prevalent they have almost become a new orthodoxy.